Today: A simple, elegant side dish, with ingredients you probably have on hand already. This post is brought to you by our friends at Noritake. Noritake’s Colorvara Chocolate is featured below. WHO: Cassie Jones is an American photographer living in the Netherlands. 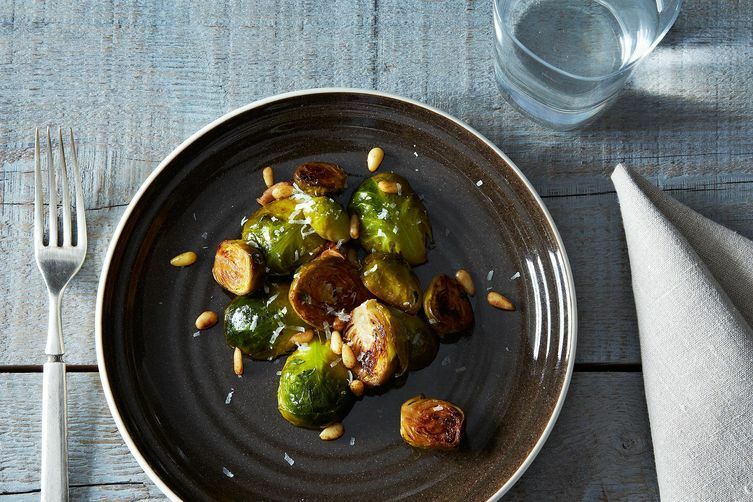 WHAT: Nutty, caramelized, special-occasion brussels sprouts -- in 15 minutes. HOW: Infuse your olive oil with garlic, steam your brussels sprouts with white wine, then, when the liquid cooks off, let them caramelize. Garnish with Parmesan. WHY WE LOVE IT: With this recipe, you get the best that Brussels sprouts have to offer: cut sides eager to be browned, with insides that get soft and creamy. The white wine adds a fruity acidity, and the pine nuts and thyme make it special, elegant. This post was brought to you by Noritake. I cook dinner for my friends a couple of times a month and they "expect" my Brussels sprouts. I'll have to try these.